Kamakura based web/app company Kayac reproduced a cyber space in a popular anime series “Ghost in the Shell – Stand Alone Complex(S.A.C. )” at Parco Part 1 department store, Shibuya, Tokyo. 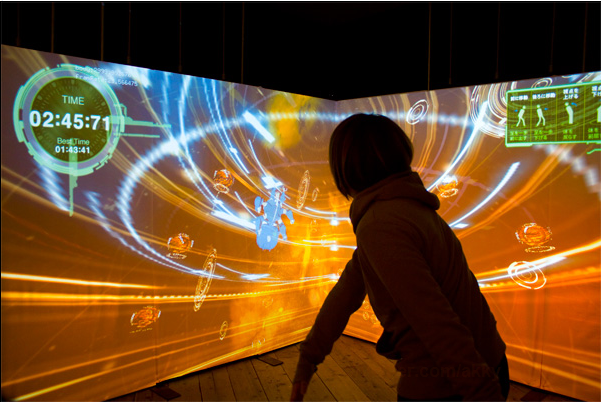 By using kinect input device with big screens, visitors can experience to chase and catch out Tachikoma, an AI tank (Wikipedia) in the virtual space. A new age in interactive technology takes you directly into the world of anime. Celebrating the 3D re-release of “Ghost in the Shell: Stand Alone Complex Solid State Society” (ph9.jp/​) from March 26, Kayac Inc. has created a special promotional booth that places you right inside cyberspace. Using Microsoft’s Kinect Sensor visitors can interact with the virtual anime landscape in the Cyberspace System using just body gestures and movement. Your mission: Locate and capture the Tachikoma character in the cyberspace. Be warned, you only have a limited time! No joysticks, no controllers, no buttons…Float freely through cyberspace just by twisting your body to turn, leaning forward or back to shift perspective, and placing one step in front or behind to move. You can finally “capture” the Tachikoma by sweeping down with one arm. Try the experience for yourself at the S.A.C. Premium Shop inside monozoku, on the fifth floor of Parco department store in Shibuya, from March 24th to April 19th. It’s harder than it looks! Hat tip to our reader Jake.